Are you new to the hobby and want to learn how to frag corals successfully? Are you an advanced aquarist and you’re looking for a few of the secrets of coral fragging and want to have better success fragging your own corals. 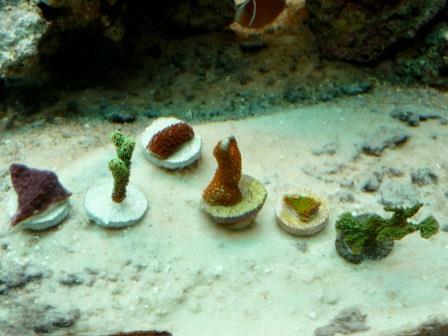 Is your local aquarium club hosting a coral frag swap and you want to know how to quickly and easily frag a few of the corals in your reef tank for the frag swap? Whatever the reason, I collected some of the most helpful information from across the interwebs, here in post. It may take you a little while to slug through all of the how to frag corals videos, so feel free to bookmark and share the page and come back when you have more time to view all of the videos and learn all of the secrets of how to frag corals shown here. I figured I would start out this how to frag corals successfully series with a species that you’re very likely to be successful with–the Devil’s Hand Coral. Leather corals, in general, are hardy and easy to frag. Lobophytum corals are easy to frag because the lobes themselves provide logical, easy to locate fragging points. Using a sharp pair of stainless steel scissors, simply cut one or more of the lobes off. Leather corals, when damaged, can release chemicals into the water–so it is typically best to frag corals in a container separate from your main tank, when possible. Then, help the coral attach to live rock rubble, a shell, or a frag plug using a rubber band (as shown in the video below). As an alternative to securing the loose frag with a rubber band, you can try the bridal veil method. Place some pieces of rubble, shells or frag plugs in a small plastic container. Add the soft coral frags to this container and cover the container with bridal veil or with the plastic mesh that citrus fruit is sometimes packaged in. Place the container in an area of the tank that doesn’t have a ton of flow, and let the frags attach naturally. If you are patient, you won’t even need to do anything to create frags with the prolific branching leather corals (capnella, sinularia, cladiella). In my experience, these guys ‘drop’ branches all the time on their own. By that, what I mean is that the coral actually cleaves a branch off the mother colony, and the branch floats in your tank until it gets stuck somewhere. The branch attaches naturally and the frag starts growing. For that reason, a lot of people who have had success with these corals consider them (somewhat affectionately) to be weeds. It can be really hard to tell some of the various species of capnella, sinularia and cladiella apart. From a how to frag corals perspective, this is actually good news, because you would frag each of these branching leather coral species in much the same way. Using a sharp pair of stainless steel scissors or a razor blade, cleave off a branch, dry the frag out briefly on a paper towel and then attach the frag to a piece of live rock with a rubber band or let the frag attach to rubble naturally. Left to its own devices to grow, xenia will reproduce frags without much help at all from you. It will start growing, pretty much wherever you place it, and will start budding and creating clones of itself as it creeps along the substrate. So the easiest way to frag this coral is to put small pieces of rubble, frag plugs or shells in the path of growth. The xenia will grow right over top of the rock and you will have yourself a nice frag to trade. If you can’t wait for that, and you want to know how to frag corals like this more aggressively. Check out the next video. The technique is pretty straightforward: use scissors and cut a few of the soft bodies. Try to get as close to the base as you can. That is the technique shown in the video below. Fragging mushrooms is actually the way I first learned how to frag corals. Mushrooms are extremely hardy corals that will also grow and spread on their own. They extend part of their base and pinch it off…that small part of the base then grows into a full-sized mushroom. If you want to speed things along, you can frag mushrooms by cutting them with a razor blade. You can slice it in half or virtually into as many pieces as you want. It can be tricky to get mushrooms to attach to the rock/substrate you want. I’ve had the best success using rubble in a small plastic container. Mushrooms are actually the very first coral I recommend you try fragging. Be careful when fragging these corals. If you have not already figured out how to frag corals, this is not the species you should start with. Not because they are particularly difficult to frag, but rather because they are a bit dangerous. Be sure you wear safety goggles, gloves, and make sure you don’t have any open cuts exposed. These corals can release a chemical called palytoxin which can cause big, big problems (even death, in extreme circumstances). Zoas are encrusting corals that will grow right over whatever substrate they can touch…so the easiest way to frag them is to place some rubble right in their growth path. They’ll grow right over it and can be removed easily later. If you want to frag them a bit more urgently, you can learn how by watching this next how to frag corals video. Small Polyp Stony Corals (affectionately called sticks or fuzzy sticks by many) are easy to frag and much less easy to keep happy, healthy and growing in a reef tank. Interested in fragging a plate coral, like montipora? You can follow the step-by-step how to frag corals instructions in this next video. 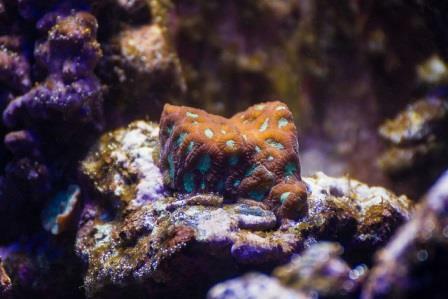 Right now, Acans are still some of the hottest corals in the hobby. They’re easy to frag, if you have the right equipment (like a water-cooled, diamond coated bandsaw). Watch out for your fingers, but the cut is pretty straightforward. You need a power tool of some sort, because these stony corals can have a pretty dense skeleton. Favia (brain corals) are generally hardy but are slow growing corals. You frag them in much the same way you would frag an Acan, using a bandsaw to cut around the individual polyps. Euphyllia corals are another group of popular Large Polyp Stony corals that are regularly fragged in the hobby. These corals are usually seen in one of two growth ‘types’, they either grow as a solid wall or as a branching coral. The branching corals are really easy to frag…just use a strong pair of wire cutters or bone cutters and snip off a branch well below the polyps. Wall-growth versions are a bit trickier. You would use a bandsaw to zip right through the whole animal. This can be messy. A lot of the time, the corals don’t make it through the fragging process. So I don’t advise you frag a wall growth form Euphyllia species unless you really have to (and I can’t think of a reason you would really have to). These guys look like mushroom corals…but they’re not. They’re actually tiny carpet anemones. Watch this how to frag corals video to see the technique. Basically, you use a razor blade or really sharp knife to cut them in half, right through the mouth. This blog post wouldn’t be much without the awesome fragging videos created by their respective authors on YouTube. At this time, I am not affiliated with them in any way other than the fact that I put these videos together on one web page to help showcase how to frag corals successfully. I really hope you enjoyed this post. Please share it on Facebook, Twitter or email the link to anyone you think would find this information helpful.